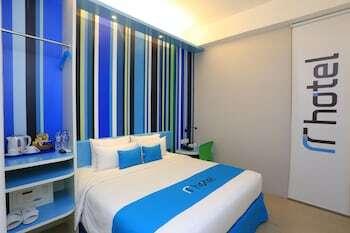 Located in Palu, Roa Roa hotel Palu is a 3-minute drive from Point Break-Tatura Mall and 8 minutes from Palu Bridge. Featured amenities include a 24-hour business center, complimentary newspapers in the lobby, and dry cleaning/laundry services. Free self parking is available onsite. With a stay at Airy Denpasar Selatan Raya Pemogan Gang Taman 21X Bali in Denpasar, you'll be within a 15-minute drive of Kasih Ibu Hospital Denpasar and Krisna. Located in Semarang, Airy Eco Semarang Timur Bangkong MT Haryono 854 is within a 15-minute walk of Diponegoro University and Simpang Lima Park. Self parking (subject to charges) is available onsite. Located in Bandung, RedDoorz near Sukajadi is within a 5-minute drive of Barli Museum and Karang Setra Water Park. Free self parking is available onsite.